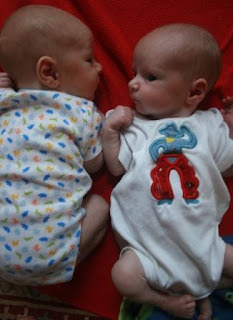 I had promised a post about the issues we faced in the early days with the twins. I've already written about the breastfeeding issues. Which we were fortunate enough to overcome. It is a lot different coming home with two babies instead of one. And having a toddler at home as well! On sleeping: although we initially had two bassinets, we put the twins in the same bassinet to sleep for the first 4 months (until they were too big to fit in there together - at the end they were crammed in like sardines). After trying some different types of swaddles, we went with The Miracle Blanket on the recommendation of friends. I was fortunate enough to have my friends Heather and Carolyn loan me some spares. A lot of people claimed that their twins slept through the night early on. This didn't happen for us. At all. At 5 months old we did cry it out and now the twins sleep from 8-5 am on most nights. And I am SO thankful! On eating: the consensus is to feed twins at the same time. This didn't work for us because Cort was so distractable. So I fed them individually. However, when one twin would wake up at night, we'd wake the other up to eat as well. This kept them on the same sort of 'schedule'. I use the term schedule in a very, very loose way. On diapers: I soooo admire people who do cloth diapers. Paul mentioned it about 2 weeks after the twins were born and I started crying. I was so overwhelmed by feeding two babies, loads of laundry for 3 children, etc. that I couldn't fathom dealing with one.more.thing. So we use bulk Huggies from Sam's, and embrace our friends who are better at saving the environment than us. On colic: Around 3 weeks postpartum Reid started screaming. And screaming and screaming and screaming. It was obvious he was in pain. I called the pediatrician and spoke to the nurse. She said, "Have you tried swaddling?" She's lucky she wasn't in the room. I might've kicked her. Instead, I said in a very firm (but nice) voice, "JUST ASK THE PEDI IF HE WILL CALL IN SOME ZANTAC". Thankfully, she did. Now I know there are a lot of people who object to giving a baby any medicine. But let me say, it stopped Reid's colic. He'd been screaming in pain and Zantac made him comfortable again. It's one of those things where I feel the benefits outweigh the risks. On Laundry: Just buy a big thing of scent free All and wash the entire family's clothes in it. It'll save you so much time. On Sanity: It'll be tough. I cried a lot. I felt overwhelmed. I felt guilty, because I knew I was so blessed with having two healthy babies that it felt taboo not to be completely joyful. My advice would be to join a multiples club if there is one in your area. These women have been through it! They know! They came to my house bearing FOOD and lots of it. And they held the babies and chatted and the whole thing brought such comfort to me. On the Body: It takes time. A long time. At 6 months out I still have 5 pounds to lose and some definitely warping/flabbiness of the belly area. No stretch marks except in my belly button. Honestly, I'm not real worried about it right now. I've got other things to focus on, and will reassess when the twins are weaned. All that said, having twins will bring a lot of happiness too. Seeing them smile at each other, reach out to touch one another's faces, having four hands grabbing and flinging baby food at once...it's all so fun. We truly are blessed and hopefully, things will just get more enjoyable as they continue to grow and thrive! Hm, cloth diapers on twins with a toddler? That makes ME want to cry! Your Cool Mom Points are so high with breastfeeding twins so outweighs any deduction for disposable. You have to do what you have to do. I feel like I could have written this post. You are so honest and did a great job at capturing life with twins. Amen on the All detergent, and let me just say as a first time cloth diaperer of a new born, disposables are keeping me sain in these early days! We didn't start cloth diapering the twins until they were 1.5 and it was MUCH more doable then. Thanks for a good read, as always!